There's only two reasons IMO anyone is wanting the Camaro, either because they're GM fanboys (their Ford dissing certainly does them no favors) and/or because they see that air intake in the front as the "perfect" place for a original KITT like scanner. What would have KITT looked like if they had used the new camaro? Our answer has come..... at the SEMA show in the form of "the Camaro Black"
I think he should have been the Camaro too, but there is nothing to do about it now. I'm not going to get all up in arms about it anymore. I'm more disappointed by what they did to KARR. This show just doesn't "feel" like Knight Rider anymore. KITT's every Ford car in existance, and KARR is a robot. It feels like something else, like a stranger wearing a name tag with your best friend's name on it. Different is good in some ways, you can't just rehash the old show. But you still have to acknowledge your roots. I think they are forgetting their roots, going too far away from what the old show was. I remember watching Knight Rider when I was a kid. I was totally in love with KITT (yeah I know, I was a geek back then). He did all these really cool things, sometimes he went overboard (microwave jammer, anyone?) but there was a limit. Now it's all getting ahead way too fast, going too overboard. It's good to show support for the show. Knight Rider fans need something to keep them going. But I can't ignore my disappointment. Maybe if they make a second season, they can find their roots again. I mean, look what happened to Buffy. I just have to ask how can you be disapointed in what they did to KARR when you heavent seen what they did to him yet? We know he is an exoskelton robot car thingy (yes that is an actual technical term) but we havent seen the episode yet. Made they made him more evil and self preserving then we ever imagined. What if they made him the greatest thing to happen in the show so far? Try and be positive, and if what they try didnt work, then we will all be disapointed and can say I told you so. But until then try and be optimisitic about it. As for the KITTMARO thing, folks your beating a dead horse. First KITT was dismanteled in Knight Rider 2000, second what if they actually expain in the upcoming epsiodes that KITT was destroyed by KARR? Hench the construction of KI3T. Besides FORD is footing a major portion of the bill and Pontiac/Chevy/GM doesnt want anything to do with the show. There in my opinion no way that NBC is going to recast KITT from a Mustang to a Camaro now, the series is possibly one step away from cancellation without a major ratings boost. They are cutting episodes to save money so I wouldnt expect hem to chnage up anything else anytime soon. Sorry folks just being realistic. I don't see why the show is not getting good ratings. To be honest I haven't seen any of the episodes yet. I stay in Mid-east. And its very hard for me to get a hold of them, even with broadband. We aren't allowed to stream of NBC as well. But, from the pics and stuff available, I can see that KITT only transforms into a F150, which is cool in a way. That means he's not able to go off-road. I also see a small similarity to the "Viper" series developing with the KITTCave, etc. I like what I see. Its an improvement when compared with the TV movie pilot. Lets face it, there is very little out there right now that can touch Knight RIder. TV these days is filled with a few sitcoms, CSI everywhere,reality (sucky) tvshows. A few decent crime dramas. There are no shows for Car guys, I'm sorry Car People (must be PC). In the 70's you had Starsky's Torino & The Genral Lee, 80's introduced KITT, 90's Nash Bridges, hey it was a Cuda what can I say . No Shows today have any real cool cars, execpt maybe Burn Notice (72 Charger), but that isnt a talking indestructible car, no shows have the unique balance of humor, sci-fi and crime drama, that Knight Rideer does. Knigth Rider is cutting edge technology with a twist. Why the rating are suffering, I dont really know, execpt I know I was disapointed in the begining it wasnt following in the footsteps of TOS, or being done the way I thought it would be done. Once I put my predjudice aside and watch the episodes over again, now I see it for what it is, and what it is, is really pretty cool. Will the show win an Oscar? Probably not. But an Emmy or Peoples Choice award? Yep I could see that. Well of course it's not going to win an Oscar, it's not eligible. I could win a Peoples' Choice award if it could build a significantly larger audience, but not this year since I think it was bumped. I doubt it'd ever win an Emmy or Golden Globe though, it's not the kind of show those people go for. I can't believe this whole issue of the car is STILL coming up after a year since we found out the new KITT would be a Mustang. People just need to get over it. Or or or they just can't accept reality, I like Camaro's but KITT is perfect as a Mustang. Serve them a cup of shut the f up. Kapow!!! Haha, I agree though! Mike is a Knight, what do knights ride... a stallion... the Mustang is that stallion. Knight Rider, powered by Ford! other Fords. Besides Ford could use this to help their sales. All the Detroit 3 could use this kind o' help. Yeah, GM has made a lot of shrew moves lately. There ain't no E in Garth, damn it. HisNameisGarth wrote: Yeah, GM has made a lot of shrew moves lately. MOWE doesn't even promote the Camaro worth a damn, it was on the show once that I know of. Tony P Knight Driver wrote: I just have to ask how can you be disapointed in what they did to KARR when you heavent seen what they did to him yet? Yeah, I am probably jumping the gun. The new pictures of KARR just caught me off guard. The episode could be great. But I think I am disappointed because it doesn't feel like KARR to me. KARR is the anti-KITT in my opinion. Like fighting your evil twin. KITT fighting a robot sounds pretty cool, but I wonder if it will have that same affect on my heartrate as KITT and KARR's last showdown did. They were evenly matched, toe to toe. Uh, tire to tire. One had to win, of course, and KITT came out on top. KITT versus the new KARR doesn't have that "I'm looking into a mirror of what I COULD have been" kind of feel to it. BUt, that all belongs in the KARR thread >_< Going off track here. KITT as the mustang is something we all have to deal with. It's really not world-shattering. I just wish that if he has to transform, he should try a non ford vehicle for once. KnightRiderKR wrote: Kapow!!! Haha, I agree though! Mike is a Knight, what do knights ride... a stallion... the Mustang is that stallion. I said that when I saw the TV movie and the trailers. I admit I would have liked to see the Camaro in the role, but I totally agree that the Mustang fits very well and I like it. 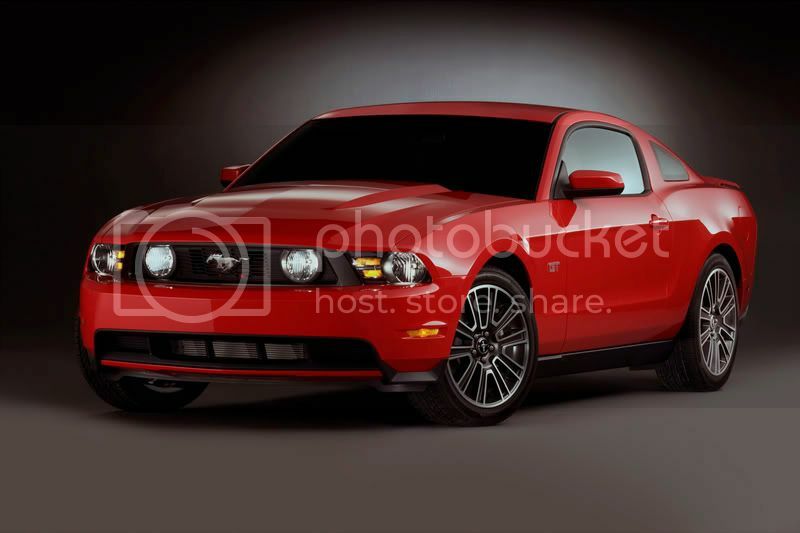 Guys the 2010 Mustang and the Camaro Black are REMARKABLY similar!!!! VERY similar hood. both have small grille with logo. both have a 90 degree front end. both have a wider back end, especially the part just behind the doors. Both have two grille sections (top, solid metal bar, bottom). From what I can see, the Camaro is the GM version of the Ford Mustang. THIS car, in my opinion, looks FAR more KITT like than the Chevy Camaro or the 2010 Mustang. That's a 2008 Chevy Cobalt SS. Yeah, yeah, it's FWD and it doesn't have a V8. Whatever. It still looks way more KITT like than the Chevy Camaro. At least it looks like it has a coefficient of drag less than 1.0, which you can't say for the brick-on-wheels Chevy Camaro Black Concept. It does 0-60 in 5.7 seconds. You see, the cobalt has the low, sloped front end. It doesn't end in a 90 degree corner. The original KITT from 1982 didn't have a 90 degree front end like the Camaro Black Concept and the 2010 Mustang. seeker78 wrote: You see, the cobalt has the low, sloped front end. It doesn't end in a 90 degree corner. The original KITT from 1982 didn't have a 90 degree front end like the Camaro Black Concept and the 2010 Mustang. I won't want a Cobalt as Kitt dude. No way its better suited for KITT than the Camaro! A 12,000 dollar econobox like the Cobalt is NO Match! jaimetheking wrote: I won't want a Cobalt as Kitt dude. No way its better suited for KITT than the Camaro! A 12,000 dollar econobox like the Cobalt is NO Match! It is obvious that KITT does not use the same propulsion system as the car used to portray it. The real Mustang GT500KR is not "mostly solar powered", and it does have spark plugs; KITT said in one of the episodes that he does not have spark plugs. Also, in the 1982 series, KITT on the show had some kind of jet turbine engine, and the real 1982 Pontiac Trans Am did not have a jet turbine engine. No doubt, FLAG would remove the gasoline engine from the Cobalt and place a high performance electric motor there, such as the one in the Tesla Roadster. Power would come from a generator, possibly a stirling engine fueled by gasoline. Gasoline engines used to drive wheels on cars are inefficient and obsolete, noisy and dirty and slow. In any case...I was talking about the appearance of the cars, and to me, a Cobalt is FAR more KITT like than a 2010 Camaro Black Concept. That Camaro, and the Mustang, are bricks on wheels. KITT would have an aerodynamic body! KITT should be a Volvo S60! Just look at this amazing KITT-like dash! Hahaha, that's awesome. Way to fan the flames! Dude, you can't be serious! This thread has gone bad. KITT looks best as a 1992 Yugo GV. stock other than the scanner. Honestly, this KITT Camaro thread has always been a pathetic joke... It just gets more sad each day. wants nothing to do with KR. End of story. A Chevy Cobalt??? Are your being serious or sarcastic? I tend to agree with Garth on this one, might as well put him in a Yugo or my mom's mini-van. BlueChaos, that dash is crazy-Pedestrian Detection- Can you imagine that going off every time you passed someone walking on the sidewalk? No, Thanks.